Air brake system is a type of braking system which uses compressed air to apply the pressure in order to stop the vehicle. Air brakes are also known as pneumatic brakes. The first air brake was invented by George Westinghouse, he introduced this type of brake for the use in trains. Air brakes are widely used in heavy vehicles like trucks and buses because they are heavy in weight and they need more effort on brake pedal to stop them, and for comfortably braking them air brake is good as it has high potential energy and does not requires much effort to push the brake pedal. They are not used is small vehicles like cars because they are light weight and space is less air brakes cannot be installed on cars. For cars hydraulic braking is good for them as they require less space. The manufacturers of braking system offer a variety of air brake equipment. However the simplest air brake system consists of an air compressor, a brake valve, series of brake chambers, unloader valve, a pressure gauge, and a safety valve. These all are connected by lines of tubing. The other braking system may have additional components such as stop light switch, a low pressure indicator, an air supply valve to supply air for tyre inflation, a quick release valve to release air quickly from the front brake chambers when pedal is released, a limiting valve for limiting the maximum pressure in the front brake chambers and a relay valve to help in quick admission and release of air from rear brake chambers. Filter: It is a filter which filters the air by removing or blocking any dust particles and allow clean air to the system. The filtered air is sent to the air compressor. Compressor: It takes air through filter. It then compresses air. Reservoir: It stores compressed air which is used for the braking system. Unloader valve: It is situated at compressor. It opens when the compressor pressure switch trips to OFF position. Brake valve: It opens when the brakes are applied by extending lines of tubing. Firstly, the compressor takes air from the atmosphere through a filter. Then air filter, filters the air sends it to the compressor where it gets compressed. Then this compressed air is sent to the reservoir through the unloader valve, which opens itself at a predefined reservoir pressure and are connected to the brake valve. The lines of tubing from the brake valve extend to the front and rear brake chambers. The air is supplied to brake chambers placed at each wheels, through the brake valve. This brake valve is controlled by the driver who can control the intensity of braking according to the requirement. 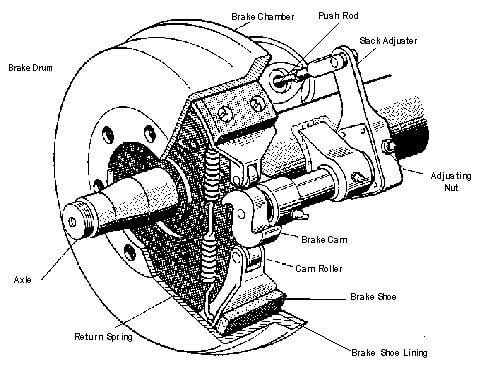 When the brake pedal is pressed, pressure in the reservoir drops which then pushes the brake pad against the brake drum and the braking action occurs and the vehicle slows down or stops according to the pressure applied. When the brake pedal is released the unloader valve gets closed and there is no pressure on brake pads. Additionally, the compressed air available on the vehicle is also used for the operation of additional assemblies of the vehicle like horn, windshield wipers, etc. It is used in heavy vehicles as we require more braking force. It is also used in small vehicles like car but there is less space for installation of air brakes. Used in trucks and buses. Also used in trains, locomotives. The air braking system is cleaner. Air is freely available so no cost for air. Reserved compressed air can be stored for afterwards usage. The air can leak very easily. When the air brakes are applied there is some kind of noise produced due to air. The noise is also produced while changing pressure from the compressor. It does not work underwater and under extreme temperature. It is harder to find leaks in air brakes as compared to hydraulic brakes. But in case of hydraulic brakes the fluid can be seen over the area where it has been leaked.